The three categories are Cities, Nature and People. NATIONAL GEOGRAPHIC IS open for entries of its Travel Photographer of the Year competition. The categories are Nature, City and People categories. The overall winner gets $10,000 and the two other category winners get $2,500 (you can submit your entries here until 31 May). The main image photo (above) was the overall winning entry of the ‘People’ category last year. Taken by the Turkey-based photographer F Dilek Uyar, the photo was taken in Konya. 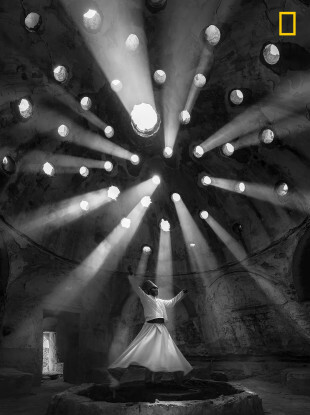 “The ‘dance’ of the Whirling Dervishes is called Sema and is a symbol of the Mevlevi culture,” Uyar wrote. Here are some of the other winning entries from 2017. Powerful eruption of Colima Volcano in Mexico on 13 December 2015. That night, the weather was dry and cold, friction of ash particles generated a big lightning of about 600 meters that connected ash and volcano, and illuminated most of the dark scene. On last part of 2015, this volcano showed a lot of eruptive activity with ash explosions that raised 2-3 km above the crater. Most of night explosions produced incandescent rock falls and lightning not bigger than 100 meters in average. This football field in Henningsvær in the Lofoten Islands is considered one of the most amazing fields in Europe, and maybe even in the world. The photo was taken during a 10-day sailing trip in Norway in June 2017. We arrived to Henningsvær after a week of sailing through the cold and rainy weather. Upon our arrival, the weather cleared up. I was really lucky that the conditions were suitable for flying my drone, and I managed to capture this shot from a height of 120 metres. This building is apartment complex in Gifu Prefecture of Japan. It is very colorful, but it is an ordinary collective housing where ordinary people can live. Besakih Temple has been known as Bali’s ‘Mother Temple’ for over 1000 years and is perched 1000 metres high on the southwestern slopes of Mount Agung. Here Balinese often come to offer up prayer and take blessing from the temple priests or “Pemangku” who reside there. Shooting in the forest, this photograph was taken in the evening hours of a humid early summer day in the forest of a small remote village in the Tamba area of Japan. It beautifully captures the magical atmosphere of Princess fireflies carpeting a stairway leading to a small shrine revered by the local people. New city on the desert. “The photo was taken on 23 July 2016 at Tongi Railway Station, Gazipur, Bangladesh. I was there for taking photos and waiting for a moment. A train from Dhaka toward another district has reached and stopped at the platform for 5 min for lifting passengers. It was huge raining. Suddenly I found a pair of curious eye was looking at me through the window and on his left an umbrella has been put for protect the rain. I got the moment. Email “From volcanoes to drones: Nat Geo's travel photo contest opens for entries”. Feedback on “From volcanoes to drones: Nat Geo's travel photo contest opens for entries”.